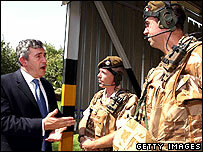 British troop numbers in Iraq will be reduced to 2,500 next spring, Prime Minister Gordon Brown has told MPs. The cuts go further than last week's announcement that forces would be cut from 5,500 to 4,500 by Christmas. Mr Brown said Britain was able to cut its troop numbers "because the Iraqis are now able to take responsibility for the security themselves". The Iraq statement came as the PM seeks to regain the political initiative after deciding not to call an election. He says he decided not to call an election because he wanted to set out his "vision" for Britain - but the opposition say he "bottled out" of calling an election because opinion polls turned against his party. There were boisterous scenes in the House of Commons as Mr Brown made the statement. He said the handover of the UK-controlled Basra province would be made in "two distinct stages". It would start with British forces training and mentoring Iraqi security forces, securing supply routes to the Iranian border and being able to provide back-up to local security forces. In the spring of next year, and "guided as always by advice from military commanders", UK troops would retain a more limited ability to intervene by force, Mr Brown said. In the first two months of the first stage, troop numbers would reduce from 5,500 to 4,500 and then to 4,000. It would then fall to around 2,500 with a further decision about the next phase made then. Mr Brown made his statement in the wake of intense criticism for his decision to announce the first wave of troop reductions during a flying visit to Baghdad and Basra last week. Tory leader David Cameron, who has been boosted by Mr Brown's decision not to call an election, reminded the prime minister that he had pledged, on taking the job, to make such announcements to the Commons. "But you didn't. You promised a thousand of our troops would be brought back before Christmas - but isn't it the case that 500 of them had already been announced and 270 of them were already back in the country?" said Mr Cameron. "I have to say to you this is of a different order of magnitude to what we've had from you over the last decade. "This is not double counting of government spending. This is not just spinning the good bits of a Budget - this is about dealing with people's lives and the families of our brave servicemen." To cheers, he added: "And do you agree with me that this is just not an acceptable way for a prime minister to behave?" Mr Brown, who said on Saturday he had decided against calling an autumn election, replied: "This was not the announcement I made in Iraq last week. The announcement I made was what would happen in the next few weeks. "This is the long-term strategy for overwatch which means the numbers of our troops fall from 5,500 to 2,500. There will be an additional 500 troops who will be outside Iraq in the region. "I make no apologies for visiting our troops in Iraq. The criticism of me would have been if I had come to the House without visiting our troops in Iraq." Sir Menzies Campbell, the leader of the Liberal Democrats, said it was time for Mr Brown to set a framework "for the complete withdrawal" of British forces from Iraq - a request the prime minister rejected. "After four and a half years Britain has more than fulfilled any moral obligation to the people of Iraq and that our obligation now is to our young men and young women in our armed forces?" he said. Your views: can Iraq cope? He also said: "Britain's involvement in Iraq has been a catastrophe." Staff who have left their jobs since the beginning of 2005 would also be able to make an application for assistance. Mr Brown said orders had been placed for an additional 140 Mastiff patrol vehicles which he said "offer the best known protection against mines and roadside bombs". There would also be extra funding for troops in Iraq and Afghanistan to double the number of internet terminals and provide free wireless internet connections.